Lavender, valued for centuries for its deep fragrant aroma, has many health benefits that this herb has to offer. 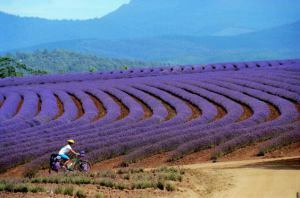 The Romans would use lavender to perfume their baths; lavender can be included in perfumes, soaps. Create a potpourri and add it with other fragrant herbs. Lavender is also great as a moth repellant, one way is to place sachets of lavender in linen cupboards or drawers, which at the same time gives that added scent. Lavender is not your normal herb that you would use in culinary cooking, however; there is an ever-increasing trend in using Lavender more within the culinary department. It is already used in salads and dressings and found in many cake decorations. The flowers and leaves are both edible, and you can use either the fresh or dried form. When using Lavender for culinary cooking, is to best to either purchased them from a Health Food Store or better still learn to grow them yourself. Here is a wonderful and refreshing taste to spruce up your drink. 2. Allow this to stand so that the ingredients can steep and to cool down. 3. In a glass pitcher, add 2 cups of the lemon juice, the lavender mixture you just made along with the remainder of the water. 4. Let it chill for a few hours. 5. Serve with ice and enjoy your drink. 6. For added variety add some food colouring to your choosing. Why not experiment a bit and add some fun. 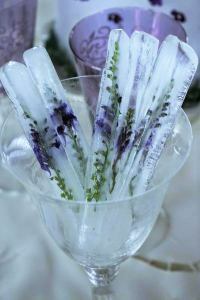 Add some sprigs of lavender in different shaped ice tray holders. This would look great at parties with variety. Remember, add different food colouring to the cubes. 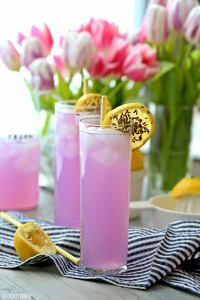 Maybe the kids could enjoy some lavender lemonade with coloured ice cubes. One of the most common uses of lavender is in the form of an Essential Oil. This is where you will find the real health benefits of Lavender. From the many properties found within the essential oil. Using Lavender essential oil can be quite beneficial in assisting those suffering from Anxiety and stress-related issues. Lavender is a great relaxant and in treating restlessness this is why it is used often in aromatherapy and other herbal remedies. Adding a few drops of Essential oil can work wonders while soaking in the bath. Not only will the aroma leave your feeling relaxed, but the anti-inflammatory and antioxidant properties found in lavender oil help to reduce the inflammation within the body. In turn, this helps to relax the aching or tired muscles along with working on the endocrine system to help lower the levels of stress the body is experiencing. This action is of great benefit to those struggling with restlessness and insomnia. Along with adding drops into the bath as mentioned above, you can also apply a few drops on the pillow just before going to bed. The aroma itself will help soothe the mind and help to relax and work on breaking that restless sleep pattern. Lavender has had some amazing antiseptic benefits in helping to promote healing. The Antiseptic properties of lavender help to fight infection and promote quicker healing of wounds. This adds to the anti-inflammatory properties already working on the inflamed area. Having a lavender spritz can be beneficial for those days when you are feeling that dryness on the skin. All you need to do in spray some of the Lavender Spritz around the area rub it in and enjoy the therapeutic results. Make your own Spritzing Oil Spray. To make a spritz you need a few ingredients. 4 oz. of Jojoba Oil (If you have difficulty finding Jojoba then you can also use olive or apricot oil. About 4 oz. of either vodka or witch hazel depending on whether you wish to include alcohol in your spray. Both Vodka and Witch hazel work well. Finally, add about 15 drops of Lavender Essential Oil depending on how strong you want the aroma to be. Place the ingredients into a spray bottle (Preferably a dark bottle) and it can be ready to use but to enhance the full potential, most people tend to leave it for about a week or two while shaking the mixture every day. When it is ready to use you can use this as a body spray after your shower instead of using perfumes and even give your pillows and linen closet a spray as well. 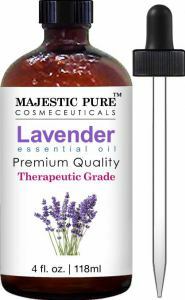 Lavender oil is great for hair growth; this is why you will find lavender in many hair care products. Lavender helps with the regeneration and is a stimulant to the scalp and skin. Those who may suffer from a medical condition called Alopecia Areata will find using Lavender Oil most helpful. Alopecia Areata is an autoimmune disease where there is a loss of hair mostly on the scalp in the form of spot baldness. 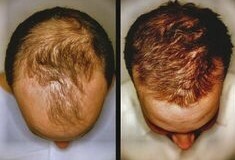 Many times this can be the result of major stress in life and as such can affect the scalp in the form of hair loss. Use can use the essential oil along with carrier oil such as Coconut oil, which blends well together. There are reports that when you massage this into your scalp every day that in with a result of hair re-growth. Lavender is part of the mint family such as Rosemary, Thyme, Basil, Sage, Oregano, and Marjoram. For those who may be sensitive to such herbs seek advice if in doubt. For some, this may only be mild in nature such as headaches or skin rashes, mild irritation. If you have had any experiences in using lavender for cooking, medical and other uses then please place your comment below. Remember your support may be the support other may be seeking along their journey in life.